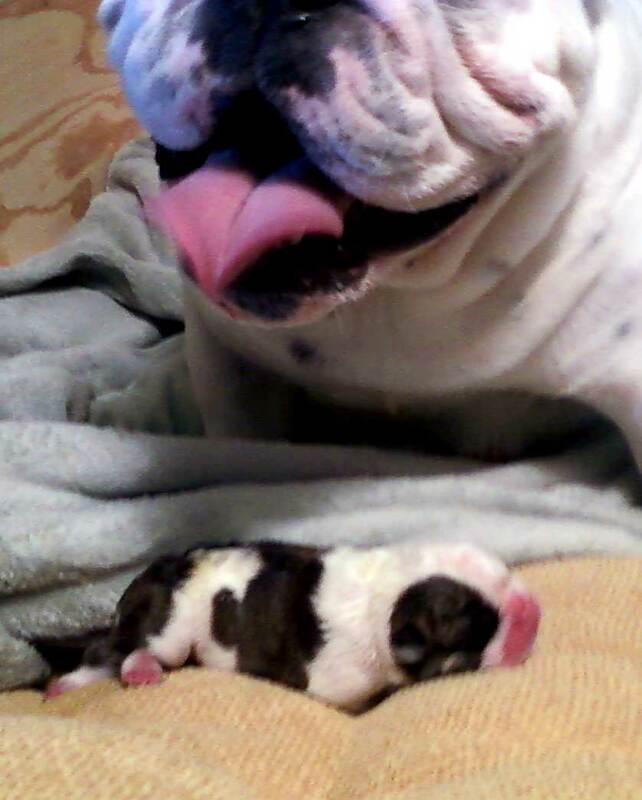 Major Tom, a dark brindle and white English Bulldog puppy, arrived on February 19, 2011, weighing in at 1lb. 2 oz. Both mama (SugarPie) and daddy (Beefeater's Muscle Man of Imok, also known as Ozzie) and baby are doing fine. Major Tom is, of course, named after David Bowie's astronaut in Space. Wikipedia defines 1969's "Space Oddity" astronaut as one who casually slips the bonds of a crass and material world to journey beyond the stars. The video was made in 1969 - David Bowie was such a genius - think about it. Neil Armstrong was the first man to walk on the moon in 1969. The other puppy was a Mummified Puppy (An unborn puppy whose development stopped during pregnancy.) Dr. Shauntelle Gallaher at Animal Clinic Northview preformed the Cesarean Section...perfectly. And indeed, the stars look very different today.